You must make bookings at least 5 minutes in advance of the time at Buffalo. Good times & great food! Buffalo is two steps from everything -- the Cutty Sark, the Maritime Museum, Greenwich Pier, Greenwich Park, the train station and even the foot tunnel – which makes it convenient to just about everywhere. There are also brilliant burgers, steaks and grills and every cocktail you’d ever want, lots available by the pitcher. Crisp tortilla chips brushed with mild chipotle salsa and topped with melted mixed cheeses, guacamole, sour cream and jalapeno slices. Strictly for the fingers. A trio of Mexican dips fresh salsa, guacamole and sour cream, served with a bowl of tortilla chips. A delicious combination of jalapeno peppers, cream cheese deep-fried and served with salad and sweet chili. Fresh mushrooms stuffed with Mexican cheese, garlic, and herbs and covered in breadcrumbs served with sour cream. Half rack of the bone baby pork ribs, roasted in our famous smoked honey BBQ sauce served with coleslaw. Fire roasted 6 pieces of chicken wings served with coleslaw. Deep fried squid with tartar sauce. Tender strips of chicken marinated in our own spices dipped in breadcrumbs and deep-fried served with BBQ sauce and garnishes. King prawns marinated in garlic, lime and coriander char-grilled with delicious garlic butter. Sizzling of marinated chicken, beef, prawns or vegetables with strips of onions and mixed peppers, shallow fried with tortilla pancakes plus sour cream, guacamole, salsa and pico de gallo salad. Tortilla pancake wrap with shredded chicken, beef and vegetables and topped with soured cream, guacamole, pinto beans and rice. Home-made deep fried crispy tortilla pancake crammed with salsa sauce. Served with soured cream, guacamole, pinto beans and rice. Beef chili cooked in original recipe of chili sauce served with sour cream, onion and rice. 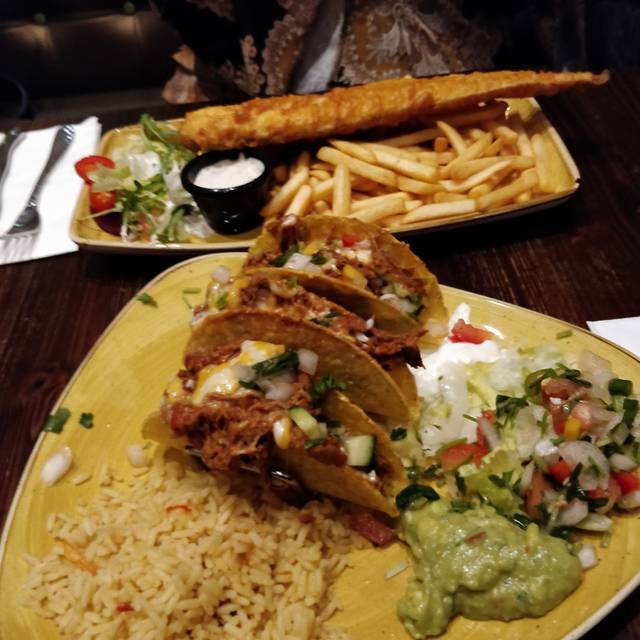 Highly spiced seasonal vegetables and 2 types of beans cooked with peppers and onions in our famous louisiana chili sauce – presented in its own pan with side plate of savoury rice, sour cream, guacamole, chopped onions and nacho chips. Three crisps taco shells, filled with one of the fillings from the list below and topped with shredded cheese, lettuce, pico de gallo – served with rice and salad. 2 x 4 oz beef burger with lettuce, tomato and red onion, served with chips. 2​ x 4 oz beef burger topped with blue cheese, lettuce, tomato and red onion, served with chips. 2​ x 4 oz beef burger, topped with melted cheddar cheese, onion rings, lettuce and tomato, served with chips and texan sauce. 3​ x 4 oz beef burger topped with melted cheddar cheese, smoked bacon, lettuce, tomato and red onion, served with chips. Char-grilled butterfly breast of chicken topped with melted cheddar cheese, onion rings, lettuce and tomato, served with chips and texan sauce. Char-grilled butterfly breast of chicken topped with melted cheddar cheese, smoked bacon and guacamole, served with chips. Veggie burger with lettuce, tomato, red onion, guacamole, served with chips. Marinated with oregano and seasoning char grilled for tender flavor. Served with chips or jacket potato. A whole rack of char grilled baby back pork ribs smothered with honey BBQ sauce, served with chips or jacket potato and salad to garnish. Ultimate combination of half rack of ribs, 6oz*sirloin steak, 4 pieces of chicken wings dripping with smoked honey BBQ sauce. Served with chips or jacket potato and salad to garnish. Char-grilled butterfly breast of chicken cooked with creamy mushroom tarragon sauce, served with rice. Philadelphia style penne pasta cooked with onions, smoked bacon and chicken in tomato or cream sauce, topped with parmesan cheese. Squids,​ king prawns, salmon with cream sauce, touch with garlic and dill. Just like a hot dogs in the big apple - a smoked pork sausage in a soft-bread roll Smashed with sauteed onions and a side of fries and coleslaw. The "Half rack of the bone baby pork ribs, roasted in our famous smoked honey BBQ sauce served with coleslaw" had no coleslaw, food was generally ok but nothing special. Post half marathon re-fuel for my daughter. Nice cocktail and wine, food and service was good. Really nice place where you can taste mexican food, that is really good. The first floor is a little bit too cold for a restaurant. The drinks are too expensive in my opinion. The food was freshly prepared & huge portions served- which was very good value. Service was excellent and will definitely be back. Had booked table but traffic meant running late. Phoned and no problem holding table. Taken quickly to table and drinks and food orders done in quick and friendly fashion. Piping hot food came and chicken burrito and chicken enchilada were both tasty and good size portions. Asked for bill and came and was paid swiftly. We were going to O2 and needed a quick turnround which we got. Would definitely go back again and spend a more leisurely meal time. Owner was nice and whole ambiance was pleasant and a very good experience. Well done to all at the Buffalo. Welcome was from a couple of staff standing in the doorway, who were obviously quite surprised to see us. I always feel uncomfortable about restaurants where the staff are standing in the doorway or the street looking forlorn. Our food was a distant and inauthentic take on Tex-Mex food. Lots more "vegetable stew" in things than I would expect, such as: Nachos, Tacos and Enchiladas. (To be honest, I don't expect ANY vegetable stew in Mexican food). I'm guessing this was "vegetarian chilli", but wasn't a welcome addition, nor particularly nice - it included baby corn, potatoes and courgettes! Lots of the food appeared to have been microwaved, being steaming hot in some places and refrigerator cold in others. The staff were mostly pleasant and helpful, but there was at least one member of staff who was so slow and miserable that it increased the generally slightly uncomfortable feeling I had about the place. Overall, the restaurant has the feeling of a place that some people have started in a tourist hotspot to make money, as opposed to a place where people are passionate about food and service. I'm sorry to say I don't think we'll be going back, and I can't recommend it to you either.